The current city councilmembers (or at least a majority of them) have finally agreed to meet quickly on Monday morning for the sole purpose of certifying the results of the recall election. Once that’s out of the way, the three new councilmembers will be sworn in unceremoniously by the city clerk during the day on Monday. Why skip the usual pomp and circumstance? Because there’s urgent business to take care of. 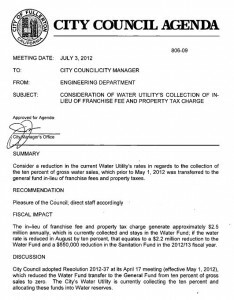 The new council has called a second special meeting for Tuesday evening to immediately deal with the collection of the 10% in-lieu franchise fee on water bills: a tax which was called illegal by the Howard Jarvis Taxpayers Association over a year ago, yet still persists today. And so at their first meeting, a fresh city council will finally have a chance to eliminate the water tax entirely – a fee that was never properly authorized by taxpayers under Proposition 218 and was illegally diverted to the general fund to pay for non water-related costs (primarily salaries and pensions) for the last 15 years. There are probably a lot of residents who wouldn’t be sad to see it go. Old Guard Won’t Go. Better Call a Judge. Now if everyone in Fullerton will please use 10% more water and plant fruit trees and a vegetable garden. This will increase the health and IQ’s of the residents thus virtually ensuring that the demise of the deposed remains permanent. Off to the Fullerton garden stores this weekend. Here’s to the boosting the local economy, the health of our families and the beginning of the end of the insanity in our local government. I’ll plant to that. In the interests of public health, refunds need to be issued in the form of vouchers that can be used to install reverse osmosis systems in every residence in the entire city-24 million will cover it. We are in the process of removing the contaminants out of city hall and now we can get it out of our water as well. What a big blow hard. Oh and thanks Travis you’re such a hero. Can I get a ticket signed off? after they get rid of the illegal tax can u get rid of corrupt Hughes, I mean Captain Hughes? And I’m guessing city atty Jones must be yawning right now at that thought. As soon as Felz and the chief are gone. Is the money collected illegally for the last 15 years being refunded to the people it was illegally collected from, including those who’ve moved or died (pay to their estates)? by the way which majority members will be meeting Monday morning? or would you have to kill us if you told us? After voting in favor of this illegal fee for a number of years, I will finally get to vote for its elimination. See what a two faced person I can be? Thanks to Travis for stepping in to represent us! Because of him thing look much more hopeful in our town. I like the idea of coming hard out of the starting gate – but remember new council people – this is a race. Please don’t fold halfway to the finish line. After you dismantle the water tax you need to clean out all the trash from the appointed city government positions. All those people who backed the old regime must go. Replace them at a rate of one per month. That is a reasonable goal. Come down on FPD like a ton of brick. Call Hughes out on the carpet. Demand that he apologize to the citizens of Fullerton for the disgraceful behavior his department has cast upon the City. 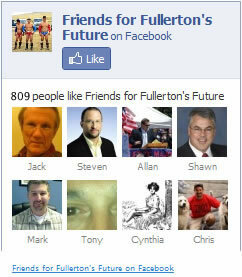 FPD has embarrassed Fullerton not just nationwide – but worldwide. A forced apology is better than no apology at all. Now I agree with JustUs! This is a refreshing change following the culture of inaction and hesitation. I’m proud to be a fullertonian! I am waiting for the catastrophic insurance clause to kick in for covering all the police abuse of force cases. So what insurance company will be willing to assume the new policy with such a poor FPD record? One of those Lloyds of London policies at ridiculously high rates? What does the city manager have to say about all of this? Hello? Hello? Any leadership there? I note that the new deal would become effective 8/1/12. Hmm. That’s another $200,000 collected. ¡No bueno! I’ll bet that the termination date will be up for discussion. I hope so. Felz and Hoppe are sure fighting a rear guard action every step of the way. Collected and then returned, less administrative costs. What happens to all the money that is now collected from the illegal water tax and sent to the kneejerk “escrow” account? I mean whats in there currently. As a soon to be member of the City Council, should you still be blogging your opinions about City Business. Isn’t the City Council Meetings NOW the proper forum for your opinions? I appreciate your report on the vote on Tuesday, but Get Real! Gee, and there was I thinking that the First Amendment was still the law of the land. And blogging about opinions is bad because? Travis’ opinions on the water tax are already well-known and well-documented. Furthermore he is alerting the public of an important issues. There is no testimony he hasn’t already heard and is perfectly in his right to have formed an independent and competent decision on this matter. The taxpaying citizen’s should know exactly what the government is up to, at all times and knowledge is not required to be divulged in some formal setting …the City is not allowed to have secrets from the people- That was the problem with the old regime. What opinion? What was said was information. Would you prefer to be left in the dark until game time about which direction the city is heading in? Welcome to the future Get Real. Where is Sharon’s opinion? Is it a secret? How about the cardboard fence sitter? Does he have lockjaw? Travis and Bruce have already spoken. The most transparent candidate won by the largest margin. Hmmm. I think we may have something here. Liberals hate getting rid of taxes, legal or otherwise. Poor Quirky has no choice. She’s running for State Senate and none of her alleged supporters south of the I-5 are going to like it that she’s been tack in 10% onto water fees to pay for pensions and perks (including her own). Ditto Chaffee. Hurry up! My plants and lawn are almost dead. Watering gets more expensive every day. Yes he has a right to voice publically his opinion. And I would defend that right! But now as a member of the City Council, he now has the duty to lead the City in a responsible way. We have all had the experience where we have been part of a group and then had the situation of becoming the leader of that group. With leadership comes responsibility to act like a leader. As a citizen, blogs are a good way to express your viewpoints, But as a member of the City Council, I would hope Travis would keep somewhat of an open mind to what the public says at the meetings and use that info as part of his decision tree. I have attended many City Council meetings and gave opinions and watched those opinions go over the head of the three disposed members…. a waste of air and time. We elected three people to replace those three so OUR voice will be heard. So that we would have open minded people leading. I basically agree with his viewpoint about the water tax. But I disagree with the blog forum as the place for him to vent them. … now! I received info on the meeting from the City of Fullerton email, which included full info on the proposal etc. In fact they emailed me three times! Its no different than the three dead incandescent light bulbs leaking over blue label at an ozone party in Raymond Hills. Content is key and not the forum. Now Travis can reach even of his constituents that put him in office and reach even more that didnt vote or even know who he is. I would encourage the others to do the same. I know that there are those that use or are used by the editorial slant of the Observer so what gives? Apples and oranges? Not. What do you consder “his viewpoint” ? You think just because councilmembers don’t publish opinions, they don’t have them? I like knowing how my leaders think ahead of time. It helps prepare my argument against them. Transparency! It’s good for everyone. I’m still wanting to know what Travis’s opinion was here. (Howard Jarvis-1997) and even so, the Fullerton CC has been sending it to the general fund for 15 years-this is documented. 2-There is a council meeting on July 2nd to certify the results of the recall election which current councilmembers have agreed to. I guess you’re right…he didn’t even include any opinions. What? I haven’t read such incomprehensible writing since the sixties. You do remember the sixties? Or as Robin Williams said, If you remember the sixties… you were not there! Disappointed, no comment from Travis. Get Real Fact Since 1970 this fee has been 10% Previously it was 2%. (68-69) That makes this “illegal” fee 42 not 15 years. Get Real Fact: Funds that go into General Fund have no traceability unless funds are designated. (That is what has Sacremento Challenged since 85% of General Funds are designated). General Funds by design pay for salaries, pensions etc. Thus to state where specifically these 10% fee goes to is impossible. ( Who’s salary did it pay? )But by stating it and pointing out “pensions” a hot button only inflames the situation. He had me at hello but lost me at goodbye. Stick with facts. The fee has been illegal since Prop 218 was approved – and that’s 15 years. It has been a shameless scam for 44 years. Fact: the 10% add on went into the General Fund; no General Fund revenue pays for purchase or transmission of water. The vast majority of the General Fund goes to pay salaries and pension costs – read the budget. Salaries and pension costs of water employees is taken from Water Fund 042. The ten percent went into the big pot. The big pot was consumed by salaries and pensions. Your sophistry is showing now that you’ve dropped your shorts.